Tucker is one of Harvest Home’s founding residents! The co-founding humans of Harvest Home were on Craigslist and saw a post for a “free goat” who was no longer wanted. When they arrived to pick up Tucker, he was tied to a post out front. Tucker rules the front pasture at Harvest Home and keeps the other boy goats in line…even though he is the shortest, smallest one! He has been known to try to keep the humans in line, too. 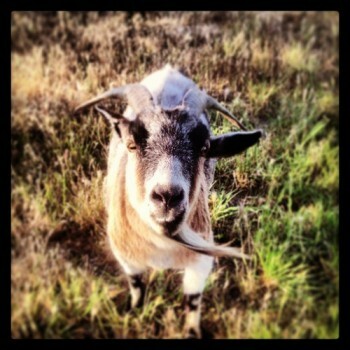 Tucker is a playful goat with a mischievous streak.